I just finished a compelling book entitled, An Unquiet Mind. Written by a psychologist who has bipolar, I learned a considerable amount about this mental illness. I work in he bubble of mental illness. I have a family history of mental illness. I may or may not get diagnosed with a mental illness at some point in my life, but I have had moments of severe and debilitating stress (many of us have). So even with my work, education, exposure, understanding and acceptance, I still have a lot to learn. Until reading this book, I didn’t truly comprehend the complexity of the condition. It’s hard for anyone who hasn’t experienced the true highs of mania and the utterly despairing lows of depression to get it, I think at least. And when we do see or hear about someone experiencing bipolar, it’s often on television or the radio and it’s often sensationalized. I think Silver Linings Playbook did a pretty good job, but not a perfect one. 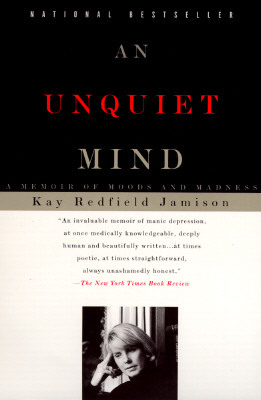 Throughout this book, Kay Redfield Jamison, talks openly about her struggle to maintain her illness, but also her professional career as a psychologist – a very well known one at that. ‘I kept on with my life at a frightening pace. I worked ridiculously long hours and slept next to not at all. When I came home at night it was to a place of increasing chaos: Books, many of them newly purchased, were strewn everywhere…My apartment looked like to had been inhabited and then abandoned by a colony of moles. There were hundreds of scraps of paper as well…one scrap contained an incoherent and rambling poem; I found it weeks later in my refrigerator, apparently triggered by my spice collection, which, needless to say, had grown by leaps and bounds during my mania. I had titled it, for reasons that I am sure made sense at the time, ‘God is a Herbivore'”. In this particular mania, sounds and music became extremely intense for her. She would listen to classical music, overwhelmed by emotion, only soon to become frustrated with the pace and switch to rock music. How utterly frightening to experience a nightmare during the day, in front of you, as if it were completely and utterly real. After reading this book and recently hearing another woman recount her experience with bipolar during an education session, I have developed a greater respect and appreciation for what individuals with bipolar experience during their highs and lows. We assume that people can control their behaviour, thoughts and thus, actions. We often expect this even from those with a diagnosed mental illness. Yet, do we expect someone with diabetes to control the release of insulin (or non-release for that matter) from their pancreas? Do we expect someone with cancer to stop their cells from cancering and spreading throughout their body? Do we expect someone with heart disease to stop the formation of plaque within their artery walls? No. So why then do we expect someone to control the neurotransmitters involved in bipolar from being released in the brain? Why do we expect someone to control the loss of certain neurotransmitters associated with depression? Psychological conditions are physiological in nature. They are no different from diabetes, cancer, or heart disease in the sense that they influence the inner workings of the body.Yes, they are different in how they present, but that’s all. For me, this book once again reiterated the complexity of mental illness and the ever-present discrimination attached to it. Jamison held off on writing the book, sharing her story with the masses out of fear. Of course, those who worked closely with her knew as she never wanted to compromise the safety of her patients. No one would ever want to put themselves through the extreme highs and the extreme lows of this illness. The benefits of hypomania are clear and difficult to give up as Jamison mentions, but she would rather give up the added productivity and energy to eradicate the extremes that this illness has made her feel. But it’s important we realize that people aren’t “faking it” and cannot just “get control of their minds”. I encourage you to read this book; to learn more about mental illness; to challenge your assumptions.